Like Godzilla Kitano Takeshi is a Japanese post war phenomenon. Forged in the nuclear ash of Hiroshima and Nagasaki this child of the American occupation rose to become both destructor and saviour of Japanese cinema. Kitano may not fire lasers from his eyes or reign fire over Tokyo but he can level an entire audience with the slightest of looks. Kitano’s films like “the Emperor” Kurosawa’s have often been appreciated by foreign audiences rather than domestic ones. This oddity stems from Kitano’s schizophrenic relationship with the Japanese public. Kitano is in fact two men inhabiting the same body: Kitano Takeshi the auteur director and Beat Takeshi actor, comedian and television media personality. He is also a poet, a painter, an author, critic and pop star. He was even responsible for Takeshi’s Castle. This media super-persona first flashed into existence in 1989 during the filming of the unconventional police thriller “Violent Cop.” Cast as the lead, Beat Takeshi was asked to take over the project by the producers when the director Kinji Fukasaku fell ill. Kitano very much the amateur filmmaker back then dispensed with his crew’s Western style of shooting and imposed an arch stillness into his frames. These static compositions dare the audience to work for their narrative pleasures. 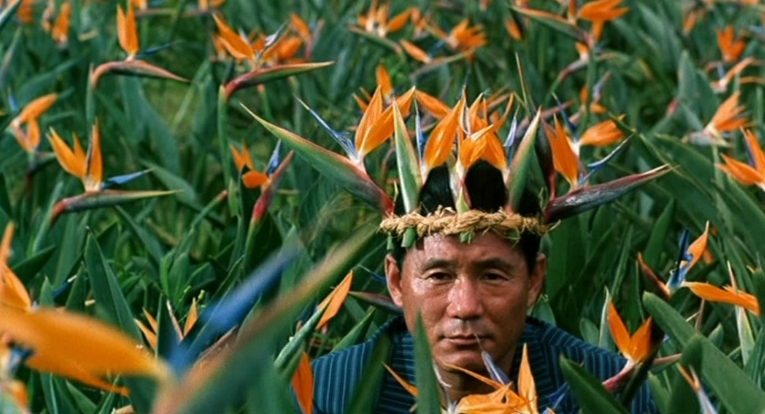 Kitano offers few close-ups or musical cues to hint at any of his character’s inner thoughts and feelings. This quiet sparseness when coupled with his long takes gives the spectator time to retreat inwards. They delve into their own experiences to fill in the gaps left by Kitano’s uncluttered mise-en-scene. As Kitano’s auteur style became established in his follow up “Boiling Point”, questioned with the leftfield “A Scene at the Sea,” re-established with the peerless Yakuza movie “Sonatine,” and cemented in the award winning “Hanna-Bi,” so Beat Takeshi’s on screen presence was also perfected. Stoic, indefatigable, cruel, prone to spiteful violence and with a walk to rival John Wayne’s plus a squint to rival Clint Eastwood’s, Beat Takeshi the screen star was not only distinct from his director’s personality; but started to distance himself from Beat Takeshi the television sensation. In 2005’s “Takeshis’” Kitano tackles these complicated identities seemingly head on. He plays two characters called Takeshi: one a famous film and television star Beat Takeshi and the other a down at heel actor Kitano Takeshi. A chance meeting between the two identical men leads to increasingly surreal vignettes where all the actors also play multiple roles. The character of Kitano Takeshi eventually tries to murder Beat Takeshi with a stash of Yakuza guns. On the surface this metaphorical act of slaying a self-created monster ego should reveal much about the real Kitano. In fact it reveals nothing. The Kitano Takeshi in “Takeshis’” has his hair dyed blond like Beat Takeshi in Zatoichi rather than appear like the real life Kitano. This again masks Kitano’s true intentions about what he actually, if anything, wants to tell his audience about his very peculiar brand of fame. During their onscreen meeting in “Takeshis’” Beat Takeshi doesn’t even acknowledge that Kitano Takeshi looks identical to him as he nonchalantly signs his autograph. Is this slight intentional or does it hold any significance on how he views himself or his art and does “Takeshis’’ provide any answers at all? “What proves fascinating about watching Kitano’s films,” writes Aaron Gerow in his excellent book “Kitano Takeshi,” “is the realisation that they are too complex and sophisticated-and often contradictory-to be contained by any frame the theoretician or even Kitano can impose.” He is the ultimate post-modern auteur-not one director but several directors inhabiting the same body who works with his own doppelgangers. Kitano best sums his movies up himself,” The one thing about films is they seem to be showing things that are true, but they aren’t.” And who could argue with a phenomenon?